When a British record producer arrives in Montgomery, Alabama to hook Marty Roy, a young black musical prodigy, he launches us back into Marty's tumultuous upbringing. The son of a gospel star and self-proclaimed healer, Marty spent his childhood writing the songs that have made his charismatic father famous. But in a nation on the verge of social upheaval, with the rising heat from the street guiding his pen, Marty finds himself at odds with his spiritually forceful father as he strives to create a masterpiece that will change America - no matter the cost. A funny, fiery, one-of-a-kind show, The Total Bent is about the passions that divide a father and son as they make their music and make their choice between salvation and selling out. "...The score, featuring a blistering array of funk, gospel, soul, blues and rock, fills the small space at Haven with a six-piece band under Hill�s musical direction. Brown (who also directed �Passing Strange� with now-defunct Bailiwick Chicago in 2011) keeps Stew and Rodewald�s musical manifesto in near-perfect calibration between being �ironically detached� (as Marty is described at one point) and delivering a full-throated cri de coeur for musical salvation." "...A self-aware musical, occasionally vulgar and often hilarious, this is an emotional ride through familial and religious resentments before the characters find reconciliation. When Marty sings "my suffering remained after the myth of your love was explained," his relationship with his father carries powerful religious overtones that make The Total Bent more than a great musical: it's also great art." "...Among so many striking aspects of the show, we get to see and hear several songs composed, Joe Roy's sacred version, then a retake by Marty Roy in a profane rock style. One such is "Sinner I Know You're Lost." It's a lovely classic hymn as Joe Roy originates it; but it is transporting when Marty Roy redoes it in a swinging rock style, coupled with the refrain, "I gotta get up on the cross."" "...Rifts between fathers and sons have long been fodder for drama as well as comedy, and both are present in abundance in Stew and Heidi Rodewald�s The Total Bent, a musical now being presented at the Den Theatre by Haven Theatre in association with About Face Theatre. The play, which features some dynamite music and top-notch performances, is a bit threadbare on plot but still very entertaining." "...Powerful script and impeccable storytelling make The Total Bent, in this writer's opinion, is a theatrical event like no other." 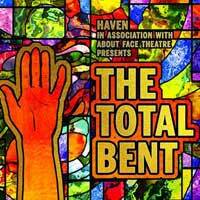 "...Haven Theatre and About Face Theatre partnered on The Total Bent, producing a stellar production depicting a strained relationship between a Black father and son clashing on modes of survival and music. Directed by the stellar Lili-Anne Brown and written by frequent Tony Award winning collaborators Stew and Heidi Rodewald, this immersive musical is an expressionistic homage to Black bodies, the LGBTQ community, and freedom."